Wow that is so opulent, I love it. They do rather shout for attention but in a good way. 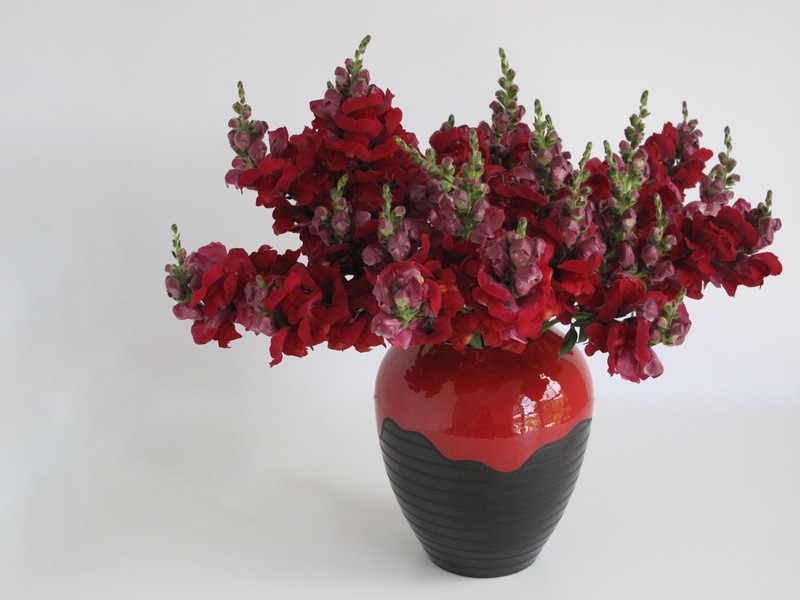 I love Snapdragons and that deep ruby colour is one of the best. 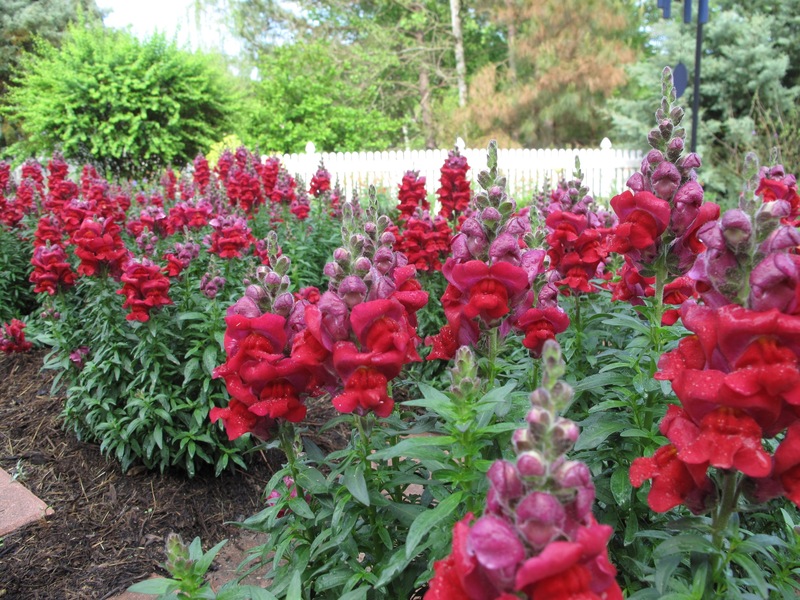 Snapdragons are something I’ve come to appreciate in the last couple years. I’ve never grown them from seeds and red is the only color I seem to be able to find in autumn when I get around to planting some. Love the meditation circle! 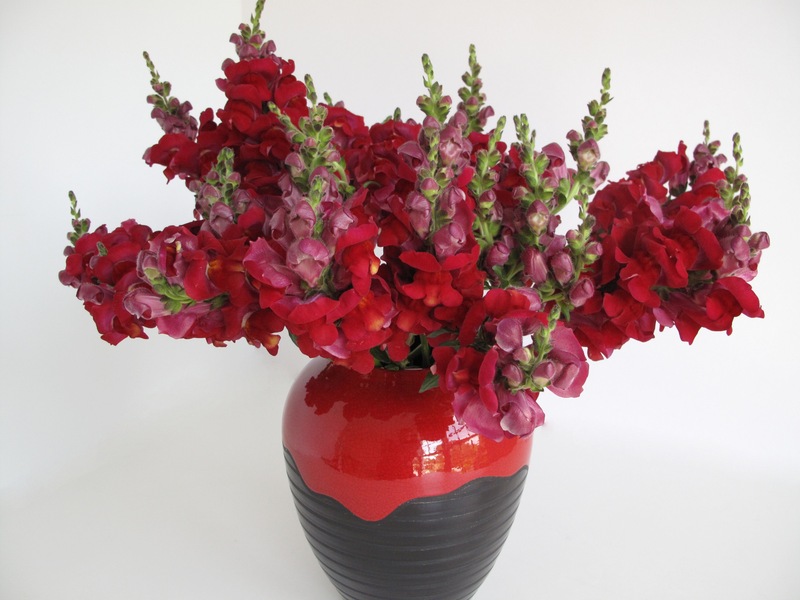 And those snapdragons are over the top gorgeous!!! Your vase looks so luxurious ! Thanks, the labyrinth got a much-needed cleanup this spring. I pulled out a lot of thyme that had spread too helpfully. Oh how striking! Was your meditation circle full of these last year? The 2 shades work well together and, as you say, don’t need anything other than themeselves to make a successful vase. Thanks for sharing it and making such an effort with your photographs! Thanks Cathy. 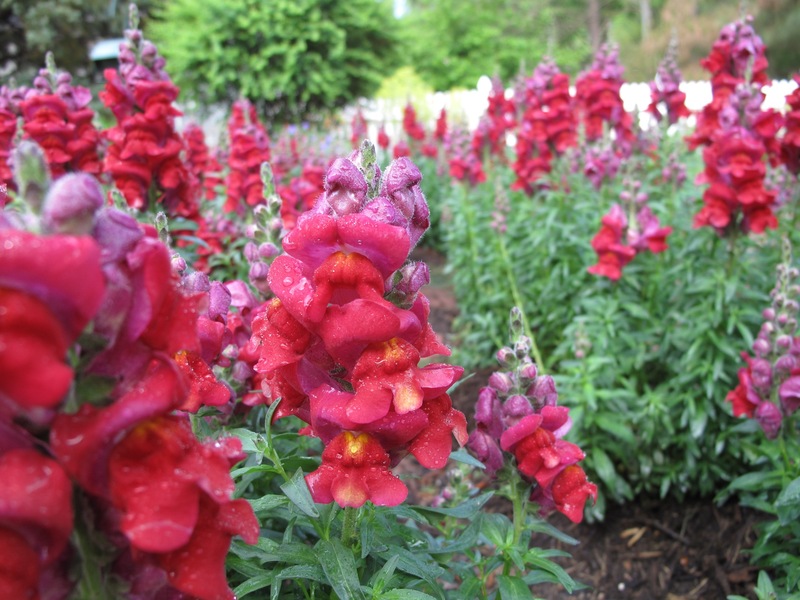 I did use snapdragons last year as well in the meditation circle. They bloom a while in fall, then come back in spring. You certainly had the perfect vase. Your Snap Dragons are so robust. 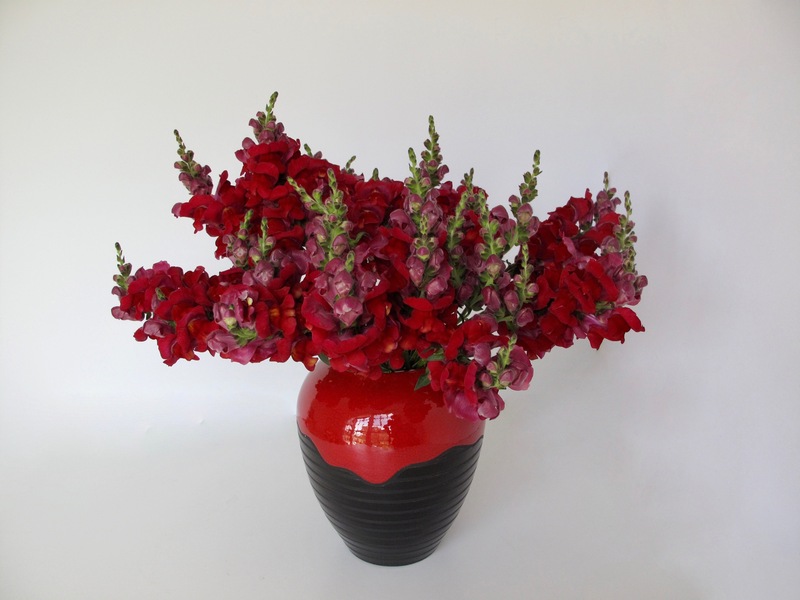 Thanks, the red in that pot is so strong I don’t often use it for flower arrangements, but in this case I needed something that could stand up to the strong color of the snapdragons. Are those Liberty Snaps? My absolute favorite, wonderful to see them again. Sorry, I don’t know. The label didn’t indicate what kind of snapdragons these are.They are extremely fragrant though. Probably Ribbon or Liberty, love them both, especially the Crimson. The red is so rich in person. I couldn’t really capture just how intense it is. Very impressed with you success from seed! Wish I’d grown these from seed Marian, but actually I purchased them as plants at Southern States last fall. I don’t have much luck with seeds. None of the sweet william and other seeds I planted last autumn came up. You certainly make the most of that meditation circle, Susie – it always looks great! I love snapdragons but they’re perpetual rust magnets here (not to say that keeps me from trying to grow them at periodic intervals). Thanks Kris. The paths in the circle had lost their definition because the thyme had spread a lot and the thyme didn’t look great all the time, so I pulled out a bunch of it. I’ve been lucky with the snapdragons for the past two years. I pull them out when it gets hot. You have certainly won the snapdragon contest. I’ve had little or no luck with them. Well done, and in a lovely vase to boot. Thanks John. Must be beginner’s luck on my part that the snapdragons did well. Really have been amazing this year. Wow, what an abundance of snaps you have, Susie! Great choice of vase – a perfect compliment. Thanks Eliza! The snapdragons have been delightful this year. Even before they opened the plants were very attractive. Thanks Annette. Hope to keep ahead of weeds in the garden this year, well for a couple more weeks anyway. 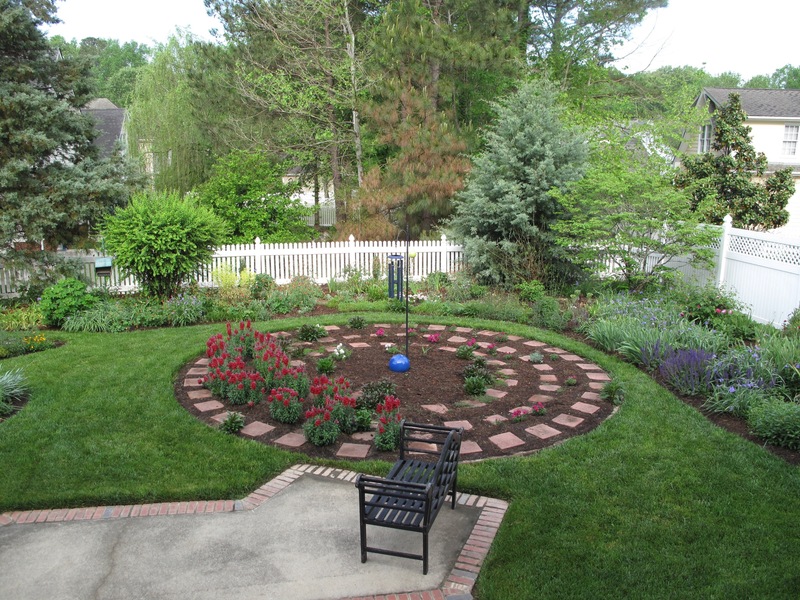 The mulch helps make it look tidy. Glad you like the vase. The potter has a wonderful selection. Judy, glad you connected with the snapdragons today. I’ve been amazed at how strong and showy these have been. They take me right back to childhood and squeezing the little flowers. A wonderful vase and a gorgeous colour. I don’t know why reds are so difficult to photograph. Thanks Alison. I should think little children would have a grand time playing with these flowers. 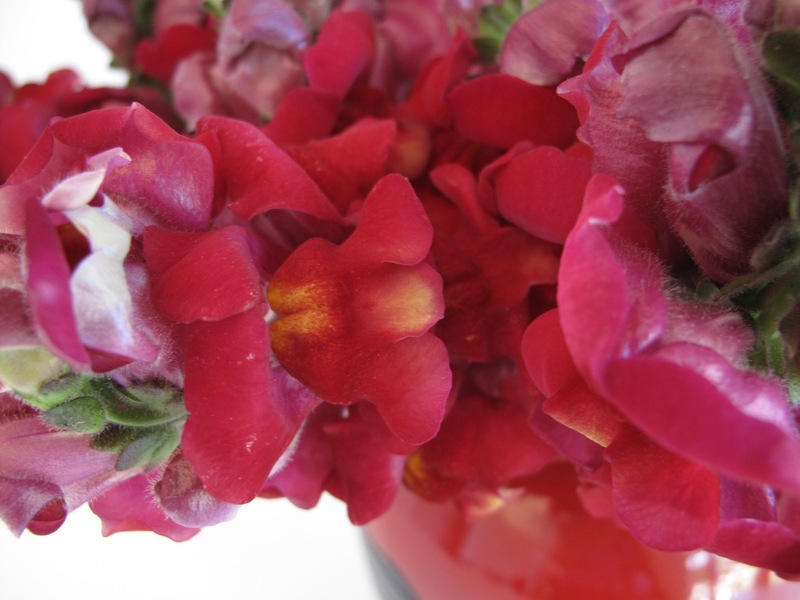 Wow, I have never grown snapdragons and had no idea that they are so pretty close up or that they are scented. Thank you for sharing that. I will look out for them. Cath, I hope you can find some to try. I’ve been pretty amazed at how interesting they are up close and they’re showy from a distance. Stunning! The combination of those flowers and the vase make a fabulous statement – ‘Look at me!’ The circle looks so pretty with them growing there too. 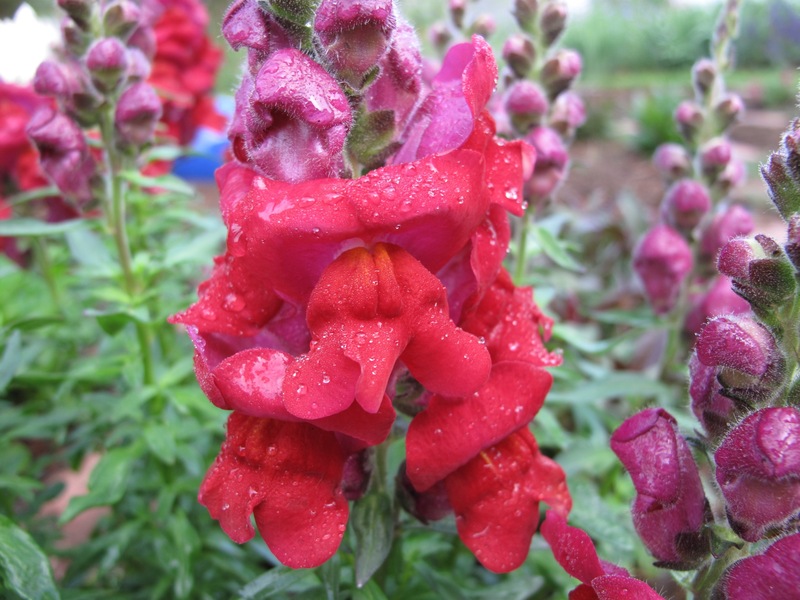 Oh, that is a pretty snapdragon! I grew snapdragons for years, but I haven’t had much luck with them recently (probably because that part of the garden is shadier than it used to be). That’s a perfect vase for that beautiful arrangement, too! I’m fairly new at growing snapdragons Beth and they have startled me at how dramatic they are. Wow! Such a lovely color snapdragon and the Raku pot is also beautiful. The photo came out perfect, the trip up and down the steps and around the house has paid off. That was a marathon photography session and unfortunately it was just a brute force approach. Not sure I learned how to get better pictures, just finally did. The flowers have aged gracefully and have more color variation near the top. Stunning!! The flowers, the vase, the combo! Thank you Beverly. The flowers have aged ever so gracefully too. The photo is stunning. If the real thing is even better, I don’t think I could stand it.